Aaron Bloom, chair of the firm’s Litigation Department, is a trial lawyer who solves problems. Practical and efficient, he achieves great results both inside the courtroom and through informal settlements. Mr. Bloom handles a wide variety of entertainment, real estate, intellectual property and general business litigation matters for high-profile clients. Among other things, he is also an expert with respect to electronic discovery and the enforcement of judgments. Mr. Bloom is an AV® Preeminent™ rated lawyer by Martindale-Hubbell. 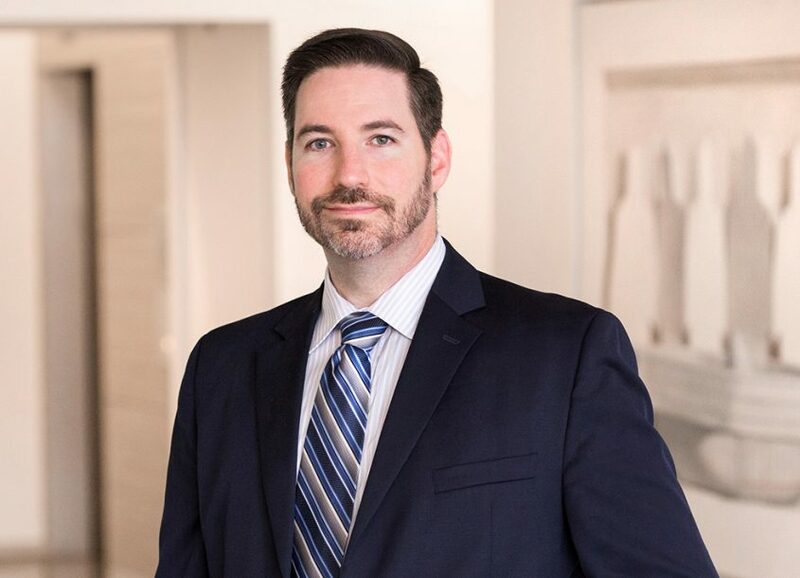 Mr. Bloom began his legal career at Greenberg Glusker Fields Claman & Machtinger LLP, where he advanced from summer clerk to associate to partner. Represented a film production company, which was sued for alleged copyright and trademark infringement days before the worldwide release of a theatrical motion picture. The plaintiff immediately sought a temporary restraining order to prevent the release of the film. We successfully defeated the ex parte TRO, and shortly thereafter successfully moved the court to dismiss the lawsuit pursuant to Rule 12(b)(6). Represented a Japanese film distribution company in successfully enforcing a nearly $6 million debt owed by two film production companies. In 2012, our client’s judgment was amended to add an alter ego of the film production companies, and the alter ego appealed. In 2013, in a published opinion, the Court of Appeal affirmed the lower court’s ruling in our client’s favor. Defended the largest social networking website in Europe in litigation alleging that it had copied the “look and feel” of the largest social networking website in the United States, including traveling to Europe to interview key players and ensure the proper preservation of electronic evidence, and defeating numerous procedural motions brought by the other side seeking discovery. The case settled after (a) the Court first issued a ruling that it was inclined to grant our client’s motion to dismiss the action on forum non conveniens grounds (but would defer issuing a final ruling until it was prepared to decide our client’s motion to dismiss for lack of personal jurisdiction), and (b) soon after that ruling, our client achieved victory in related litigation in Europe which likely would have had preclusive effect here. Represented a television producer in a partnership dispute with another television producer. The other television producer had breached his fiduciary duties to our client and failed to honor our client’s rights in the partnership. A favorable settlement was reached part way through arbitration. Represented a German entertainment and distribution company in a breach of contract suit brought by an American film production company regarding an output agreement. A favorable resolution was reached at arbitration. Represented television producers in connection with audits of participation statements issued to our clients in connection with a successful television series. A favorable settlement was negotiated without the need for litigation. Represented a children’s entertainment company in a lawsuit against a company that licensed to our client broad worldwide exploitation rights of a well-known animated series. The licensor wrongly terminated the license agreement and attempted to extort higher payments from our client for rights that our client already had under the license agreement. A favorable settlement was reached at mediation. Represented television producers who purchased two Pablo Picasso paintings from a well-known art dealer. Unbeknownst to our clients, the dealer had the paintings on consignment from two different parties, refused to pay either of the consigners, and then fled the country. Multiple lawsuits ensued regarding title to the paintings. A favorable settlement was reached with both consigners. Defended an entertainment company in a federal court lawsuit brought by a record company that alleged our client had wrongfully used the plaintiff’s music in connection with a television show. The lawsuit was dismissed by the plaintiff after we informally demonstrated that the suit lacked merit and threatened Rule 11 sanctions. Represented an investor who had invested a substantial amount of money in a film production company pursuant to a promissory note. Our client filed a lawsuit after the film production company breached the terms of the promissory note. A favorable settlement was reached at mediation. Represented a well-known actress in a boundary line dispute with a neighbor. A favorable settlement was reached through negotiation, and without litigation being instituted or the dispute ever being made public. Represented a real estate investor who was defrauded out of $350,000 by the sellers. In addition, the attorney who originally represented our client in the transaction committed malpractice and breached his fiduciary duties to him. Our client achieved an approximately $400,000 judgment against the sellers, and a judgment of over $400,000 against our client’s former attorney following trial. Represented the owners association of a condominium medical office building which sued a hospital company for attempting to sell a large block of condominium units (as part of a larger sale involving four hospitals) without complying with the association’s right of first refusal. The hospital purported to “carve out” the units and gave the association a sham notice for an artificially inflated price and only days to close escrow. After a bench trial, the court upheld the association’s right of first refusal and required that a new notice be issued with the price and terms established by the court. The association then acquired the units. Defended an individual who sold his Pacific Palisades home and was sued by the buyers for allegedly failing to make full disclosure regarding the geological condition of the property. A favorable settlement was reached at mediation. Represented a couple who purchased a home in Lake Sherwood and sued the seller for failing to disclose that the house suffered water intrusions and contained a noisy sump pump that was designed not as a back-up, emergency system, but rather as the property’s main drainage system, whereby outside ground water was intentionally brought into the house before being pumped out. A favorable settlement was secured at mediation and prior to litigation being filed. Represented landlords who owned eight single family homes, each of which was subject to poorly drafted purchase options in fixed term leases that became month-to-month tenancies. The landlords gave notice that the old leases were being terminated and that the tenants could continue to rent their homes only under new, more precise leases. Most of the tenants attempted to exercise the purchase option contained in the old leases and litigation ensued. One favorable settlement was reached prior to litigation, two tenants vacated without any actual or threatened litigation, four favorable settlements were reached at mediation, and one case was favorably resolved via a motion for summary judgment. Represented a commercial landlord in a complicated unlawful detainer action. The landlord and tenant had entered into a promissory note whereby past due rent was amortized along with interest as monthly payments. The tenant then made payments that had no correlation to either the ongoing rental obligations or the note payments, and many of the tenant’s checks bounced. The landlord also issued apparently conflicting balance statements. The landlord contended that the tenant owed approximately $50,000 (total outstanding rent plus attorneys’ fees) and needed to vacate the premises. The tenant contended that it only owed a fraction of that amount and did not have to vacate the premises. A Settlement Agreement and Stipulation for Entry of Judgment was reached just before the start of trial whereby the tenant would pay $47,000 and vacate the premises in two weeks. Represented the long-term, master lessee of a Southern California marina in a lawsuit against the city that owns the marina. The city engaged in bad faith conduct in an effort to get out of the lease, including concocting several spurious notices of default, stonewalling the approval of a sublease to a major subtenant, and even twice amending its municipal code in aid of a meritless claim that our client was operating the premises in violation of local law. A favorable settlement was reached during trial. Represented a Palos Verdes couple who brought suit regarding a property line dispute with their neighbors. The neighbors tore down our clients’ fence, and threatened to tear down our clients’ gazebo, both of which encroached on the neighbors’ property. A temporary restraining order was obtained, and a favorable settlement was reached at mediation whereby our clients obtained a permanent, exclusive easement over the disputed area for a nominal amount. Represented a general contractor who adapted an historic building for residential apartment use in litigation against the building’s owners, who continuously made grandiose changes to the project but later refused to pay for those changes. The subcontractors also filed lawsuits against the owner and the general contractor. A favorable settlement was reached at mediation. Favorably resolved a trademark and counterfeiting lawsuit we filed on behalf of a Japanese golf club manufacturer. We obtained a permanent injunction on behalf of the client, along with approx. $1 million in monetary payments from the other side. Early on in the action, we got the other side’s cross-claims (seeking $110,000 per month in damages) dismissed via an anti-SLAPP motion, and we received an award whereby the other side was required to pay all of the attorney’s fees and costs incurred by our client in connection with the anti-SLAPP motion. Represented a video game distribution company and its subsidiary in litigation against former officers and directors who breached their fiduciary duties to our client. While still serving as officers and directors of our client, they created a competing company and began to transfer our client’s assets to that new company. A favorable settlement was reached at mediation. Litigated several multi-million dollar bankruptcy disputes on behalf of a liquidating trust, which is the successor-in-interest to an affiliate of one of the largest privately-held homebuilders in the country. In 2013, the Bankruptcy Court held that our client retained its membership interest in an LLC that owns nearly 100 acres of land worth millions of dollars. The other LLC member appealed. In 2014, in a 17-page opinion, the United States Bankruptcy Appellate Panel of the Ninth Circuit affirmed the Bankruptcy Court’s ruling in our client’s favor. In 2013, the Bankruptcy Court granted our client’s motion to disallow claims totaling nearly $10 million. The claims were based on claimants’ alleged rights of contribution, and the motion was based on certain waiver provisions contained in the subject contract. Represented half of the partners in a business management firm in a business divorce with the other partners after the other partners committed numerous breaches of fiduciary duty and engaged in improper billing practices and gross mismanagement. A favorable settlement was reached at mediation. Defended a construction company in a breach of contract lawsuit filed by a company which stages newly built homes with furniture and art work in order to assist in the sale. A favorable settlement was reached at mediation. Represented an employee who was sexually harassed while working for a large automotive company and then fired in retaliation for reporting such behavior to her supervisors. A favorable settlement was negotiated after sending a demand letter to the company on behalf of our client and without the need for litigation. Represented an individual who made loans to friends who then refused to repay those loans. A favorable settlement was negotiated without the need for litigation. Enforced a nearly $10 million judgment in favor of our client, a real estate investment company. The enforcement efforts included filing a separate lawsuit for fraudulent transfer in connection with a fake lien that was recorded against one of the judgment debtor’s properties to make it appear as though there was no equity in the property when, in fact, there was approximately $5 million of equity. The court granted our client’s motion for summary judgment in the fraudulent conveyance action, and the entire dispute settled shortly before the Sheriff’s sale of the property. Enforced a judgment for over $5 million in favor of our client, a film distribution company. The court granted our client’s motion for an assignment order, which effectively froze the judgment debtor’s income stream. Our client also had the judgment domesticated on the East Coast after discovering a bank account there in the judgment debtor’s name that had nearly $1.5 million in it at the time of levy. The entire dispute settled shortly thereafter. Enforced a judgment in favor of our client by levying on various storage units containing the judgment debtor’s personal property, including valuable works of art, antiques, and collectibles. The judgment debtor had fled the country and placed the storage units under his mother’s name. Court orders and writs were obtained, and the sheriff levied on the storage units. Our client then purchased the contents of the storage units at the sheriff’s auction and re-sold the items at private auction for substantially more money. Enforced a judgment in favor of our client by levying on real property in the name of the judgment debtor’s wife. The judgment debtor had fraudulently transferred all of his real property into his wife’s name shortly after he defaulted on payments to our client pursuant to an agreed-upon payment plan. Our client received all monies due under the judgment, including additional amounts for the attorneys’ fees incurred in connection with the enforcement proceedings.